Robert del Naja is in no mood to talk about the past. Which is tricky, because as the force behind Massive Attack’s current live spectacle (a reconfigured outing for their 1998 album Mezzanine), a degree of unpicking old memories might seem unavoidable. Still, sitting backstage in the clinical dressing room of an Amsterdam concert hall, each of us angled at either end of a sofa an hour before he’s due on stage, Del Naja considers his unease with historical rehashing. Mezzanine was supposed to spell the end of Massive Attack. By the time it was finally released, months late, in the spring of 98, the group – Del Naja (aka 3D), Grant Marshall (Daddy G) and Andrew Vowles (Mushroom) – had been fighting for a year and were barely speaking to one another. They recorded individually, gave interviews separately. The album, their third and moodiest, was a distinct, post-punk swerve away from the hip-hop and breakbeat culture they had championed in Bristol. It came slickly packaged in a Nick Knight sleeve with an acid orange disc, and was released to mixed reviews, but, in true Massive fashion, it came to be belatedly revered as a masterpiece by critics everywhere from Pitchfork to the Paris Review. It also became their biggest commercial success, gifting the singles charts (and countless film and TV directors) Teardrop, Angel and Inertia Creeps. Despite their ubiquity, the songs still very much stand up. Live, they’re menacing, resonant, moving. Nonetheless, after multiple furious rows about the new direction, soon after the album’s release, Mushroom left the band. On stage earlier, tension is redirected into the technicalities. Soundchecks are, in my experience, routinely boring. A band stops, starts, stops, repeats the same riff over and over while someone is asked to check the lights and a sound engineer perfects the levels of a hi-hat. Naturally, Massive Attack do things a little differently: the venue in which they are due to play two sold-out shows is bathed in red light and, as their PR and I creep towards the stalls for a seat, they deliver a full, seemingly note-perfect run-through of Teardrop. A life-affirming, butterflies-in-stomach exclusive for an audience of two. 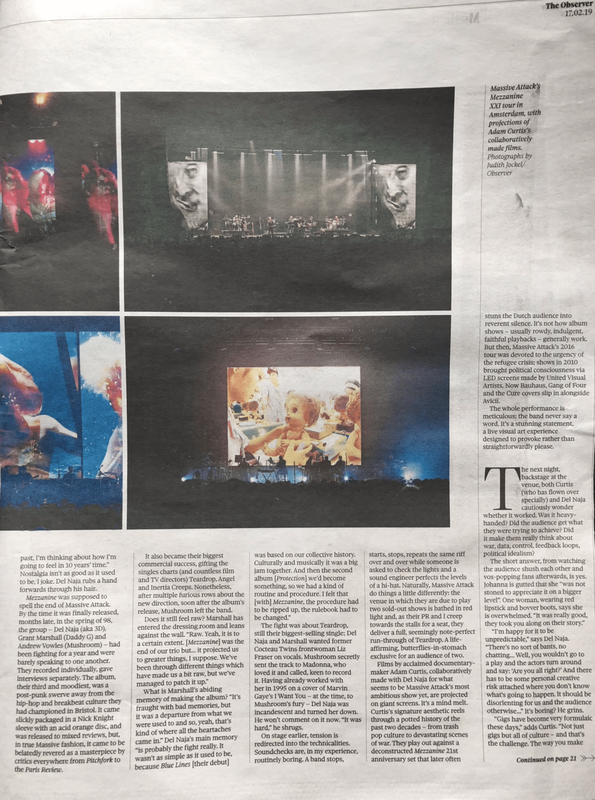 Films by acclaimed documentary-maker Adam Curtis, collaboratively made with Del Naja for what seems to be Massive Attack’s most ambitious show yet, are projected on giant screens. It’s a mind melt. Curtis’s signature aesthetic reels through a potted history of the past two decades – from trash pop culture to devastating scenes of war. They play out against a deconstructed Mezzanine 21st anniversary set that later often stuns the Dutch audience into reverent silence. It’s not how album shows – usually rowdy, indulgent, faithful playbacks – generally work. But then, Massive Attack’s 2016 tour was devoted to the urgency of the refugee crisis; shows in 2010 brought political consciousness via LED screens made by United Visual Artists. Now Bauhaus, Gang of Four and the Cure covers slip in alongside Avicii, while a YouTube mashup of fan videos is both wry and moving. The whole performance is meticulous; the band never say a word. It’s a stunning statement, a live visual art experience designed to provoke rather than straightforwardly please. The next night, backstage at the venue, both Curtis (who has flown over specially) and Del Naja cautiously wonder whether it worked. Was it heavy-handed? Did the audience get what they were trying to achieve? Did it make them curious or really think about war, data, control, feedback loops, political idealism and the rest? “I’m happy for it to be unpredictable,” says Del Naja. “That’s the point. There’s no sort of bants, no chatting because you kind of felt… Well, you wouldn’t go to a play and the actors turn around and say: ‘Are you all right?’ And there has to be some personal creative risk attached where you don’t know what’s going to happen. It should be disorienting for us and the audience otherwise…” It’s boring? He grins. The two, who first worked together on a one-off commission for Manchester international festival in 2013, make an outwardly unlikely pairing. Del Naja retains a resolutely boyish energy and is dressed in black, off-duty streetwear; Curtis, just landed from London, is in a jacket and crisp white shirt. I ask how they considered some of the more sensitive, emotional material shown – a dead body, grieving relatives – and Curtis becomes exasperated. “We were very careful about which images we used. They had to be powerful. Del Naja starts giggling, Curtis gives him a sideways Laurel and Hardy-esque sigh. The show is very much a product of their particular push and pull. It’s a long way from the romantic spirit of Massive Attack’s early days, when as part of the Wild Bunch, the collective operated a collaborative process. “I think you can forget the soup analogy,” says Del Naja, meaning it. I laugh. I like the soup analogy. I ask what their worst row has been over, then apologise for asking such a horrible question. Del Naja jumps in. This is a very Del Naja sentence: he is a master of the sort of 3am chat – the post-party and pre-dawn mezzanine – where at least one brilliant point gets made. Thoughts bounce together at speed; he uses algorithms to explain the studio dynamic of making music, and politics to make sense of art. “It’s true,” agrees Marshall. “I haven’t listened to a record, a whole album, in five years.” He makes a move to leave. “I only like about three tracks on this album, anyway,” he says, by way of goodbye. Freed from rose-tinting the band’s history, Del Naja chats warmly and intensely – about physics, artificial intelligence, the robot in his studio that he’s training to paint. “I have total faith in the next generation. Looking at their response to climate change is really interesting and, again, that’s the power of social media at its best, to mobilise people. I think that’s a real positive. I think the negative is our generation and the generation above us that are still the problem because they don’t want to change. A superfan, Richard Coffey from Ireland, graciously referred to as the band’s unofficial historian, joins the party and spends some time analysing the current arrangements of Teardrop, which he explains to Del Naja “are probably at their best at the moment”. 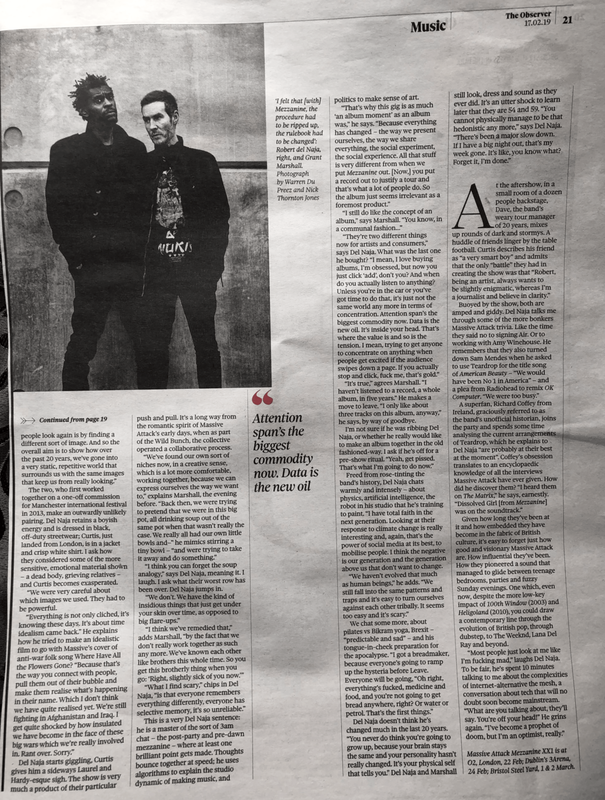 Coffey’s obsession translates to an encyclopaedic knowledge of all the interviews Massive Attack have ever given. How did he discover them? “I heard them on The Matrix,” he says, earnestly. “Dissolved Girl [from Mezzanine] was on the soundtrack.” Del Naja starts giggling again. Given how long they’ve been at it and how embedded they have become in the fabric of British culture, it’s easy to forget just how good and visionary Massive Attack are. How influential they’ve been. How they pioneered a sound that managed to glide between teenage bedrooms, parties and fuzzy Sunday evenings. One which, even now, despite the more low-key impact of100th Window (2003) and Heligoland (2010), you could draw a contemporary line through the evolution of British pop, through dubstep, to The Weeknd, Lana Del Ray and beyond.